Salon style starts with strong hair. Get 100 percent stronger hair. Ready for salon styles. Hair can lose its strength and nourishment if damaged. TRESemmE Ionic Strength contains salon grade ionic complex, which when used with Ionic Strength shampoo helps restores and nourish your hair, reinforcing its natural protection to damage. Gentle enough for daily use, your hair is strong and healthy like you have just stepped out of a salon. Apply to wet hair, gently massage and work into a lather. Rinse thoroughly. 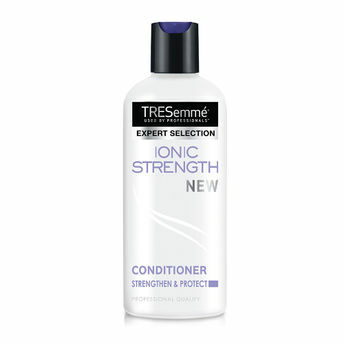 After shampoo, use the TresemmE conditioner. Store in cool and dry place. Explore the entire range of Conditioner available on Nykaa. Shop more Tresemme products here.You can browse through the complete world of Tresemme Conditioner .Alternatively, you can also find many more products from the Tresemme Ionic Strength Conditioner range.